Overcoming a horrid start and a 14-point first-quarter deficit, Drew Brees threw for 301 yards and two touchdowns and lifted the host New Orleans Saints to a 20-14 NFC divisional playoff victory over the Philadelphia Eagles on Sunday at the Mercedes-Benz Superdome. Saints cornerback Marshon Lattimore intercepted a Nick Foles pass -- which went through the hands of Alshon Jeffery -- at the New Orleans 19-yard line and returned it to the Saints' 33 with 1:52 remaining, and running back Alvin Kamara ran for 12 yards on third-and-10 in the final minute to kill the clock. The No. 1-seeded Saints (14-3) trailed 14-0 just 10:23 into the game but scored 20 unanswered points to advance to the NFC Championship Game next Sunday afternoon against the Los Angeles Rams at the Superdome. 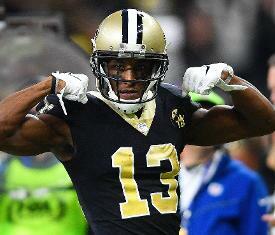 After starting 0 for 3, including an interception on the first play of the game, Brees finished 28 of 38 with scoring passes of 2 yards each to Keith Kirkwood and Michael Thomas. Thomas set Saints' playoff records with 12 catches and 171 yards receiving. "Defensively in the second half, we were outstanding," Saints coach Sean Payton told reporters following the game. "It wasn't a perfect game. There's a lot of things we have to clean up. But we got the win against the defending champions, and that means a lot. ... We've played from behind quite a bit in the regular season, and we've been able to come back. ... We did a great job of getting off the field on third down." The sixth-seeded Eagles (10-8) played valiantly despite a flurry of injuries. Foles completed 18 of 31 passes for 201 yards, but Philadelphia's offense failed over the final three quarters, amassing just 97 yards after 153 in the first. New Orleans took its first lead of the game, 17-14, by capitalizing on a withering, 18-play, 92-yard drive that consumed 11:29 of the third quarter and netted the Saints nine first downs. Brees completed 8 of 10 passes for 80 yards on the march, on which the Saints overcame two holding penalties and a false start. One of the holding penalties, on left guard Andrus Peat, nullified a 46-yard scoring pass from Taysom Hill to Kamara. Brees eventually got the touchdown, finding Thomas in man coverage against Cre'Von LeBlanc for a 2-yard score. "It impacts you relative to the number of snaps played, most importantly with your defense and their rest and your opponent getting that many snaps (on defense)," Payton said of the drive's importance. "A lot had to happen for that to take place. Regretfully, those penalties hurt us, but we were able to overcome them." Wil Lutz extended the Saints' lead to 20-14 with a 39-yard field goal with 10:28 left, but it remained a one-possession game. When Lutz missed a 52-yard field-goal attempt wide right with 2:58 remaining, the Eagles had new life at their own 42. But Jeffery's drop of Foles' pass and Lattimore's interception -- his second of the game -- sealed Philadelphia's fate. "He told me he loved playing with me and we wouldn't have won a Super Bowl without me," Jeffrey told the media after the game of what Foles said to him. "Still, I let the city of Philadelphia down." Eagles coach Doug Pederson told reporters that prior to the interception he believed his team would capitalize on Lutz's miss. "I thought we were on our way, that we got that. It just felt like the momentum at that point was in our favor, ion our hands. It's been that way all season. I felt like the magic was going to continue." The Eagles dominated the first quarter, jumping out to a 14-0 lead and at one point holding a total yardage advantage of 151-0. However, the Saints got back in the game with 10 consecutive points in the second quarter to trail only 14-10 at halftime. Foles completed eight of his first nine passes for 113 yards and led Philadelphia to touchdowns on its first two possessions. The first score was set up on the Saints' first play, when Brees badly underthrew Ted Ginn Jr. on a deep route and LeBlanc intercepted the ball at the Philadelphia 24. Foles completed all five passes for 65 yards on the ensuing 76-yard scoring drive, including a 37-yard strike to wide receiver Jordan Matthews, who easily beat double coverage for the touchdown. After New Orleans went three-and-out, Foles directed a 10-play, 75-yard touchdown march, setting up the score with a 30-yard back-shoulder throw to Jeffrey on third-and-7 to the Saints' 4. Foles got the 14-0 lead by stretching the ball over the goal line from 1 yard out two plays later. But the Saints finally got rolling in the second quarter, when Brees completed 13 of 16 passes for 171 yards a touchdown. Sean Payton successfully gambled twice on fourth down on the touchdown drive -- converting a fourth-and-1 on a fake-punt run by Hill at the Saints' 30 and then converting the touchdown on fourth-and-goal from the 2 with Brees' soft pass in the left corner of the end zone to Kirkwood. Lutz brought the Saints within 14-10 with a 45-yard field just before intermission. The drive started at the New Orleans 6 with 78 seconds remaining in the half. The loss will also bring Foles' future with the Eagles into question in the coming days and into the offseason. The Super Bowl MVP from last season may become a free agent in the spring and starting quarterback Carson Wentz's health issues will leave the Eagles with a huge decision regarding Foles. "I just told him I appreciated everything he's done," Pederson said of what he told Foles. "For him to come in and step in the way he has, I told him I loved him, and we'll probably visit in the next few days." The NFC Championship Game is scheduled to kick off at 3:05 p.m. ET next Sunday.